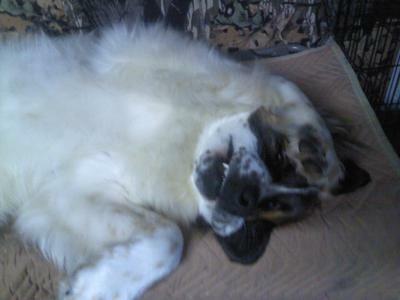 I have a 2 year old Great Pyrenees crossed with a St.Bernard. His toenails are extremely hard and can't be cut with large dog toe nail clippers. (It takes two hands to squeeze as hard as I can). He is very good when brushing and handling his feet until you get the clippers out. Then he becomes a bucking bronco and uncontrollable. I have done the relaxed watching tv approach when he is half asleep, I have done the "be still I mean business" approach, I have been given a sedative from my vet and even sedated, he freaks out at the toenail clippers. I have had him since he was a puppy and he has not been mishandled. Please advise. Had a dog like that once, and we kept his nails more pliant with hoof cream (for horses). You could try this or coconut oil. Apply every now and again. When you position your nail cutter it is also important to not squeeze the nail sides, but rather carefully place the cutting edge at the underside so that when you squeeze you cut, quickly. Make sure your cutting edge is sharp and you are well away from the quick. Hope this helps. I have had many fosters come through who ran to the other end of the yard when I brought out the dremmel (yes, nails are too hard on some dogs so dremmel is great). However, I've managed to train all of them to be fine with the dremmel. It's a grinding tool on which you can put a sanding attachment. Works very well. Have someone hold your dog and simply run the dremmel and have other person feed dog treats. Next day, same thing just to have him get used to the noise. Do this a few times. Then, next time, have person hold dog, feeding treats. You take a paw and hold dremmel near a nail and even attempt to grind the nail. He'll freak a bit. Stop. Keep doing this, and each time you do more nails. Work your way to being able to do all the nails. Eventually, you won't need anyone holding your dog or feeding treats. At the end of the sessions, always say 'good boy and all done' and throw a bunch of treats down for him.